WHAT IS THE ART + SCHOOL + LIGHT SUITCASE? 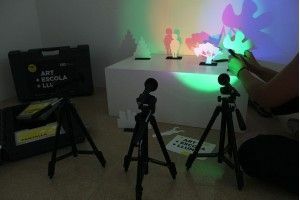 As part of the Art and School programme, ACVic Centre d'Arts Contemporànies introduces the educational suitcase ART + SCHOOL + LIGHT, to advance the presence of art in schools, and to encourage collaboration between the different participants involved. The objective of this initiative is to provide educators with simple, lightweight classroom materials to stage some of the educational experiences developed by the 30 schools involved in ART AND SCHOOL 04. The suitcase is aimed at all schools, art centers or organisations who may wish to use this resource to develop educational, artistic or recreational activities on the subject of light. Schools and educational collectives which did not participate may make use of material generated during the 04 edition of ART AND SCHOOL, adapting it according to their interests, and sharing the experience, in the collaborative spirit of this initiative. This material provides an opportunity, among others, to play with light and shadow, to change the colour of objects, to understand the synthesis of colours, to learn about the primary and secondary colours, to create an ambience, to construct landscapes and shadows, to filter light, generate reflections, construct shapes, etc. - 3 Mini High Power LED Flashlights, batteries and focus system . - 3 tripod supports for the flashlights. - One set of cut-out objects and shapes, and supports for the pieces. - 1 instruction book, with suggestions for making the experiences more involving and exciting. - There is no fee to make use of the suitcase. - Please briefly explain your activity. We will share it in the section EXPERIENCES at the artiescola.cat website, so we can keep on adding to the project, and to the possibilities which this material offers. Supported by OSIC Oficina de Suport a la Iniciativa Cultural de la Generalitat de Catalunya.